Prototype: Bavarian class PtL 2/2 local railroad locomotive as the class 98.3 Glaskasten on the German Federal Railroad DB. The locomotive looks as it did in Era III around 1954. Model: The locomotive has an mfx digital decoder. It also has a miniature motor in the boiler. 2 axles powered. Traction tires. The dual headlights change over with the direction of travel, will work in conventional operation, and can be controlled digitally. The inner boiler is constructed of metal. 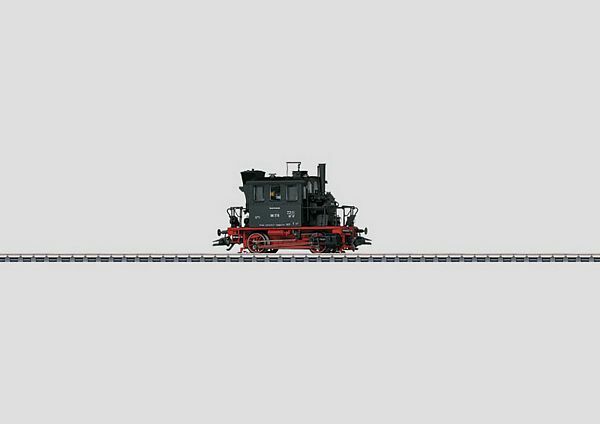 The locomotive has numerous separately applied handrails and grab irons. The boiler parts and other details are finely reproduced. Length over the buffers 8.0 cm / 3-1/8. One-time series.Branch Line Legend. The legendary DB class 98.3 former Bavarian class PtL 2/2 branch line locomotives were seldom designated with their exact class number, because these nimble branch line units were much better known by the nickname Glaskasten / Glass Box. The comparably roomy engineer's cab is the reason for this affectionate name. The cab surrounded a large part of the boiler and its luxurious glassed in area gave the engineer a good view of the tracks in both directions. Partially automatic coal firing enabled economical one-man operation of these locomotives. This meant they were predestined for lightweight branch line service. The following models of cars based on DB Era III prototypes go well with this locomotive: 43010, 43020, 43030.